“Desha suttu Kosha vodu” – Exploring a country is as good as reading a book. Well given a chance undoubtedly we all choose to explore the country. 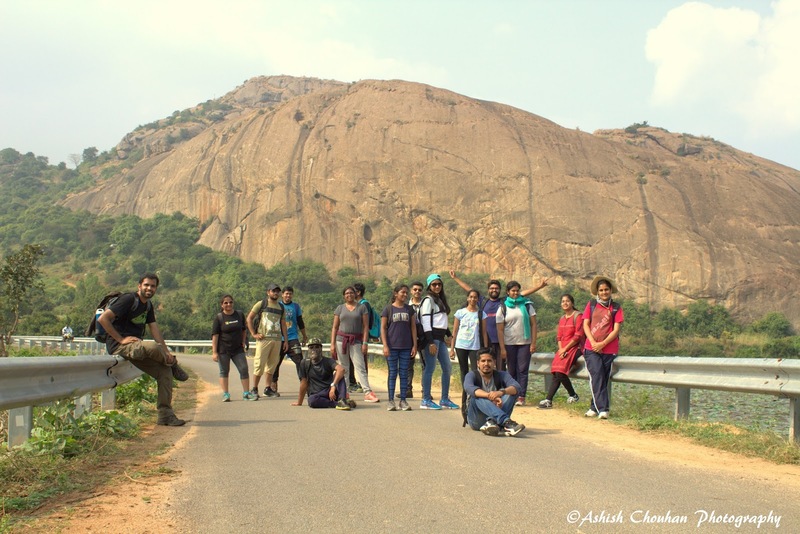 While the desire to escape from daily routing was making rounds in my mind, there popped up an invite mail from Ashish to join a trek to Jalamangala. In very short time I got to know that I was shortlisted to travel along. This was my first trek with BTC. 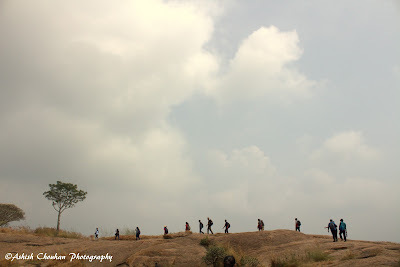 I was little worried on the previous night of trek as I had to wake up early, pack my lunch box and reach in time. I had no clue of what to expect in the trek as it was my first one using public transport (must say a good initiative). On the D-day all of us gathered at city central railway station and received instructions from Ashish and Amol, our organizers. 7.00am, 19 Nov that’s when the exciting journey began. Boarded the train to Ramanagara, the nearest station to Jalamangala. We settled down in the train and the intro session was to begin. Then came a creative idea of Dumb Charades. Yes, we had to enact our name. Wow that was interesting start to the day. Not just the BTC group but also the co-passengers in train were intrigued to guess the names. 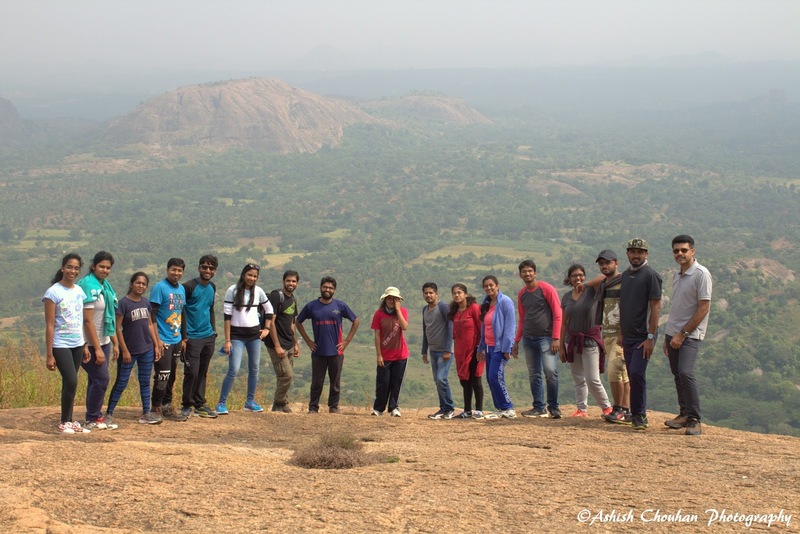 To recollect these were few actions – tick, kanth, ssshh, deepa, sofa and so on. All in all it was fun to know each other this way. By the time we are done with knowing each other we reached Ramanagara. Getting down we started walking towards the city bus stand. Some of us had breakfast at the Ramanagara bus stand and we all boarded bus to the trek point. It was a short ride. Getting down, the first instruction we received was not to litter around in the place, a big NO to plastics. As I turned around and looked from the bus stop, there stood a magnificent boulder that was calling us all to climb up. It was around 10.00am when we started walking. Initially walked up on a very easy trail. But as the altitude kept on increasing, our energy levels began dropping. Some of us were posing for pictures. Our lead Anmol started cautioning us about tigers and snakes in the route, I am still doubtful if there are really tigers there. Well the “Himmatwala”, as he called himself, was leading so no worries there. 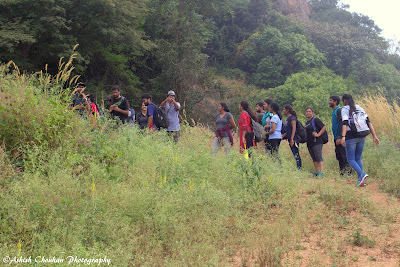 The uphill walk was tiring and I started taking breaks but the group was kind enough to wait for me till I joined them. Ashish made sure no one is left behind. Thereafter we had to climb up the rocky hill. Looked like in near past the pathway was carved into steps. That made the trek much simpler. In less than 1hour of walk we were at the top. Started exploring the place. The temple at the top became beautiful vintage background for our photos. The hill top view was mesmerizing. I am in short of words to explain its beauty. Escaping the routine, elated that I fled. After photoshoots sessions, and completing the exploration we took shelter at the Temple. The only source of shade, for believers, Almighty never leaves your hand. We shared our food. Had fun sipping/snatching the energy drinks from Ashish, sweets, chocolates from Sandeep and so much more. Thereafter started with game of dumb charades. What a gang, unbelievable movie names, each of the movie name was unheard, and difficult to guess. Hats off to the entire group. The day wouldn’t have been so fun without such an active participation. 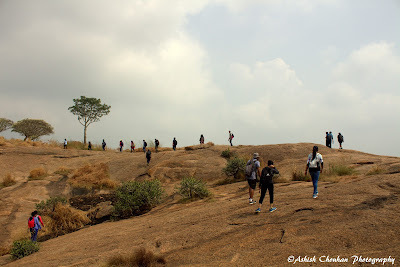 Thereafter, we started climbing down, it was much simpler and we walked till nearest busstop. There is a lake at the foothill that has a pillar standing lonely. Pointing to that, Anmol successfully fooled few of us saying there is a submerged palace in the lake. The fun didn’t stop here. As we got into the KSRTC bus, the “backbenchers” screamed at each curve the bus turned. It was no less than a roller coaster ride. The fellow passenger were equally enjoying with us. Nishant even offered soft drinks to the conductor who denied it decently. The group enjoyed and as well as spread joy to people around. Reaching back to Ramanagara we got into train back to Bangalore. Bid adieu to one another. Made friends in the group, interacted with local people, climbed hill, played, clicked pics, went crazy. What else can one do for a perfect weekend? A very well managed, not so tiring, economic weekend plan. 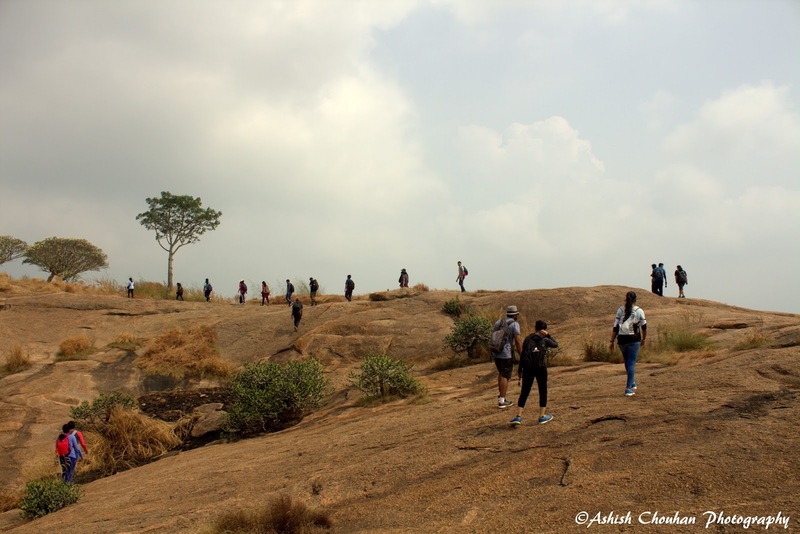 I am looking forward to join more of these easy treks that form perfect escape into nature.